Podiatry is the prevention, assessment, diagnosis and treatment of diseases and disorders of the feet and lower limbs. At its most basic level, podiatry treatment involves general foot care, such as nail and skin problems. However, we also carry out a biomechanical assessment of your feet, as problems here could lead to associated pain in the leg, back and even the neck. At Feet By Pody, our expert team of podiatrists and provide first-class podiatry treatments, including biomechanical assessment, computerised pressure gait analysis, and prescription orthotics. Our feet are often the most neglected part of our bodies, yet they endure a hefty amount of physical punishment on a daily basis. Even if you’re not suffering from a specific foot problem, we recommend regular visits to a podiatrist for a general foot health check. As part of those checks we look for faulty foot function, which can be caused by poor fitting shoes, injury, physical stress, or simply your genetic makeup. The misalignment of your feet can cause incorrect posture, which leads to associated pain and problems in other parts of your body. People seek podiatry treatment for a variety of reasons. They may be suffering pain or discomfort in their feet or lower limbs, wish to improve their posture, or prevent or reduce the risk of injury. People who do a lot of sports undergo regular podiatry assessment, and we also treat people who have been referred from other healthcare professionals, such as doctors, orthopaedic surgeons, chiropractors and physiotherapists. A biomechanical assessment is the study of the movement of your bones, muscles and joints or ‘MSK’ in our jargon, to see how they affect your standing, walking and running posture. 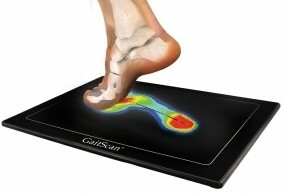 We use computerised gait scanning techniques to identify foot and heel problems such as plantar fasciitis, postural problems like flat feet or differences in leg length, ankle and Achilles problems, sports injuries, shin splints, bunions, and general fatigue. Abnormal or excessive pressure is creating extra stress on your foot mechanic. As well as giving advice on stretching and strengthening exercises to ease any pain and improve your posture, we also prescribe and fit specialised orthotics (insoles for your shoes). Orthotics are designed to relieve pain and discomfort by correcting the alignment of your body. They offer support for your feet and can be used to treat a variety of foot conditions. We use carbon fibre, polypropylene or EVA to make orthotics, and provide a complimentary fitting and review service. For your peace of mind, this includes any adjustments you may require within the first month. If you’re in a rush, we can supply and fit your orthotics in as little as 7 days. At Feet By Pody, our expert team of podiatrists has many years’ experience in biomechanical assessment and gait analysis. We identify, treat and prevent problems, taking care to explain our assessment and treatment in clear, simple terms, and answer any queries you may have. If you’re suffering from pain in your feet or lower limbs, or simply want a general check-up to ensure your feet remain in the best possible health, book a podiatry treatment with Feet By Pody today. Book Online or call 020 7099 6657 to speak with one of our friendly, knowledgeable healthcare professionals.